For those of you who may not know, Furi is a newer indie game available on Steam and Playstation 4, which features epic boss fights, and an outstanding soundtrack. Furi's developer "The Game Bakers" create a game that is very enjoyable and has great replay value, and is a shining example of indie games at their finest. Furi features a thin revenge plot, with players taking control of "The Stranger", who's end goal is to escape the prison he has been trapped in by defeating the "guardians" who reside within the prison. The main story clocks in at around 8-10 hours, but the feature of an in-game speed run challenge, multiple endings, and the ability to replay boss fights gives Furi a lot of replay ability. 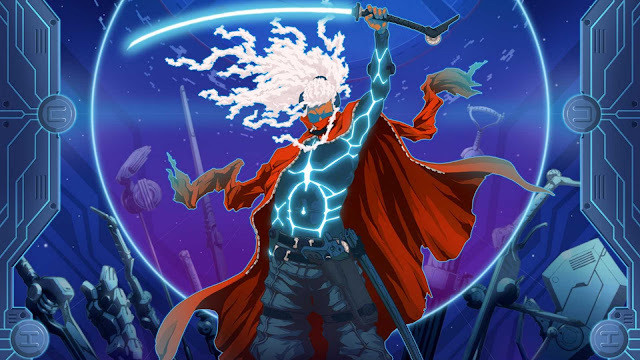 Furi is unique in the fact that the only combat is within boss fights, which can take several tries before defeating them. Furi capitalizes on the recent trend of " difficult" games like the Souls series. The difficulty stems from positioning and timing, and the fact that the player only has four abilities keeps the player form being bogged down from inputs. "The Stranger" boasts a deadly katana, a pistol with unlimited ammo, the ability to swiftly dash to avoid projectiles, and the ability to parry melee attacks to regain some health. The bosses in Furi are reminiscent of "Punch Out" in the fact that each boss has unique traits and abilities that help bring the boss to life. Each boss has a unique number of lives, while The Stranger only has three. Removing a boss's life grants you a life, but doing so is incredibly difficult. The combat in Furi flows smoothly, and feels great. Each fight is a lesson in patience and precision as you weave between your enemies attacks that are designed to challenge your timing and focus. Each fight begins with a ranged phase in which the player must dodge projectiles while whittling down the boss. When the boss's health reaches zero, The Stranger goes in for some devastating close-combat, which is the only way to defeat the bosses. Each boss fight is interconnected through walking scenes, which may seem like a minor annoyance (some of these scenes last upwards of 5 minutes), but thankfully the inclusion of auto-walk buttons saves your fingers some of the stress. "The Game Bakers" primarily utilize this down time to showcase their art and give players some plot progression. The art style is strikingly beautiful, with each level presenting a different palette and each boss having a variety of colors in their attack patterns. The Stranger himself is a bold figure of red, white, and black, while the walks in between each boss show mesmerizing landscapes, ranging from barren deserts to the void of space. One of my personal favorite aspects of Furi is the soundtrack. Furi's soundtrack is a compilation of music by several artists, such as Carpenter Brut, The Toxic Avenger, and Kn1ght. The music helps set the tone of combat, and helps the player really get into the action. Personally, I'm not a huge fan of electronic music, but the music choices for each boss fight helped immerse me even further in the game. Even if you aren't a fan of this type of game, and have no interest in ever playing Furi, I would highly recommend listening to the soundtrack, which is available on Furi's Official bandcamp page or on Furi's official website. Overall, I'd rate Furi a solid 8/10. While the plot may be somewhat thin, the combat, design, and music more than make up for it. If you're a fan of hack&slash games, strategic combat, amazing music, or intense, larger than life boss fights, then Furi is a game you should definitely add to your wishlist.